Nonprofit managers have long recognized the value of volunteers, including cost reduction, enhanced constituent services, broadened community reach, and the addition of outside skill sets and perspectives. The ability to identify, secure, and retain quality volunteers can be a key factor in an organization’s ability to further its mission and make a meaningful impact on its constituents. According to a U.S. Bureau of Labor Statistics (BLS) survey, almost one-fifth of the American adult population had volunteered at an estimated value of $188 billion during 2015. The survey also reports 72 percent of American volunteers devote a significant amount of time to the organizations they serve, an average of 52 hours annually. Managers must devote significant effort to attracting and retaining volunteers and be cognizant of the fact that there is no one-size-fits-all approach to doing so. Here are some ideas. To determine the best volunteer acquisition strategy, it’s important to know how the volunteer will be best engaged and most impactful. The three broad categories in which volunteers are typically placed are governance, program and service delivery, and fundraising (e.g., serving on the board or a committee, helping in a soup kitchen or seeking sponsorship for a marathon). Different skill sets are required for each category, and the category often drives the method of recruitment. To reach potential volunteers, locate their gathering points. According to the BLS survey, approximately 39 percent of volunteers got involved because of a friend, relative, or a personal connection within the organization. Another 42 percent approached the organization on their own. Never hesitate to ask employees to volunteer and be referral sources. Ensure your message is motivating, and get it out internally to solicit and educate potential future volunteers. Capitalize on existing technology. Use targeted social media, such as Instagram for Millennials and Facebook for Baby Boomers. Leverage any of the many online volunteer matching platforms, including Idealist, VolunteerMatch, etc. Partner with for-profit organizations where employees have the skills needed to further your mission. Corporations are more actively encouraging community involvement among their employees, and many use corporate social responsibility as a retention tool, so you will likely find a receptive audience. Make connections with key personnel through networking or by simply contacting the HR or CSR departments. Keeping in mind that according to the BLS survey there has been a slight but steady decline in volunteerism since 2011, appoint a strong volunteer management function with protocols to build long-term relationships. The volunteer manager can help foster loyalty by staying in close touch with individual volunteers to address concerns and requests and assuring that responsibilities and tasks are clear to avoid wasting time. Make it a transformational experience; not a transactional experience. Help volunteers do their work by providing appropriate tools and information. For example, in acknowledging the competitive demands for their troop leaders’ time, the Girls Scouts of the USA developed a Volunteer Toolkit, an online resource that offers meeting and project plans, as well as suggestions for activities. Ensure that your nonprofit has a culture that is welcoming and supportive of volunteers. 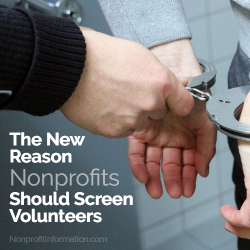 To gain the buy-in and support of staff, particularly those who will be charged with direct oversight of and engagement with volunteers, allow them a say in the planning, goals, and structure of the volunteer program. Provide both staff and volunteers with training in effective collaboration. The quality of the volunteer experience is extremely important for volunteers’ ongoing efforts and future engagement in roles that might be different from those for which they were initially recruited. 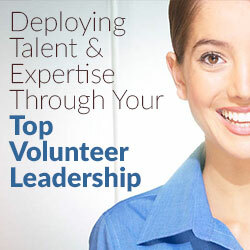 Volunteers can be the catalysts to drive the mission while preserving organizational resources. 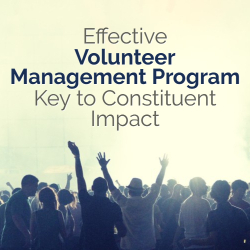 An effective volunteer management program focusing on recruitment and retention is essential in maximizing volunteer engagement, improving strategic outcomes, furthering the mission, and preserving your organization’s good name. 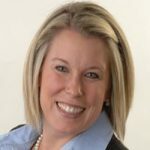 Jennifer Hoffman, CPA, and Edward Miller, CPA, are audit partners in the Not-for-Profit and Higher Education practices of Grant Thornton LLP. Ed Miller is an Audit Services partner in the East region Higher Education practice. 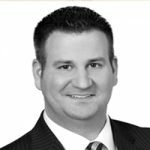 He has more than 12 years of professional experience and is a member of Grant Thornton’s National Not-for-Profit Leadership Team. He was previously with Arthur Andersen. Customer service isn’t a new concept in the for-profit industry. It’s commonplace for businesses with paying customers to have a robust customer service management process in place, and they should, considering their customers keep their doors open. Through the use of customer service management software, consumer research and marketing data, for-profit companies can better attract customers, understand their needs, appeal to their desires and provide wonderful service when needed. It’s pretty black and white determining who the customer is at a for-profit company, but what about identifying the customer of a nonprofit organization? Is the customer the population the organization serves, or is the customer those who give their time (volunteers) and money (donors)? The argument can be made that they’re both a customer, both being a different type of customer. Regardless, whether you’re being served by the nonprofits mission, or providing your time and money as a supporter, you’re receiving something in return which is a resulting experience. Exploring volunteer management through the lens of the volunteer as the customer isn’t a new concept, but it’s one that gets a lot of push back. It’s a concept that is often unrecognized, polarizing, even ignored in some circles. 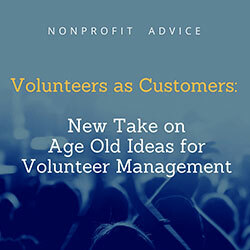 As it relates to volunteer management, try taking a “volunteers as customer” approach. Making this distinction by giving the title of “client” to the population the organization serves through its mission, and “customer” to the volunteer who serves. This being said, nonprofit organizations or volunteer administrators who take a “volunteers as customer” approach to volunteer management, spend more time differentiating between their “clients” and “customers” as they’re different people. But It’s when you come to the realization that they’re different, you begin to understand that the customers aren’t always the people you serve, and you begin to view volunteer management through a new lens that allows you to have greater appreciation for their service. Applying the concept: From a revenue generating model, to the nonprofit model. At a company or business whose goal is increased revenue, the customer purchases a product or service, and the money they spend is received by that company or business as a monetary profit. Because of the way a revenue generating business is structured, they’re designed to generate a profit that benefits the stakeholder or shareholders, often times in the form of dividends. Now, let’s apply the same concept to a nonprofit, but in this case when we refer to the customer, we’ll substitute that word for the title volunteer. At a nonprofit organization, the volunteer gives their time in exchange for advancing the mission or cause of the organization they support. The organization as a nonprofit is in the business of providing a good or service, and as a result, the community or population the nonprofit serves receives that good or service. Volunteers give something to the organization just like a paying customer, and what they give, is also just as precious as the donation of money. Whether pro bono publico or an episodic one time service project, that volunteer will essentially give something they’ll never get back, and it needs to be handled with the same delicacy as a financial contribution. Because of this, there are severe consequences if the volunteer as a customer has a bad experience, and, if the experience is great, it’ll pay huge dividends later. Implications of bad customer service. An estimated 9 out of 10 customers will talk about that bad experience, with over 50% of them talking about that same bad experience all the time. So, on average, each will tell 21 people. 6 out of 10 customers who have the intention to complete a purchase won’t follow through on a purchase solely because of poor customer service. The positive impact of great customer service. I believe volunteer recruitment goes beyond conducting outreach, and largely relying on word-of-mouth, by volunteers who continue to advocate for getting involved with the organization. When volunteers receive great customer service that results in a good experience, the below statistics can have a tremendous impact on recruitment. Nearly 50% of all people are likely to try a new product or company because of a recommendation by a friend or family member based on a positive review. The influence of a positive customer review by friend or family member has a higher degree of impact than any sale or promotion. Let’s imagine those customers were volunteers who came to the non-profit organization to give of their time. Viewing volunteers as customers, using these statistics, it’s eye opening. It makes you think about the volunteer’s experience and the implications if that experience is less than desirable. In addition, when it comes to future donations, volunteers are 10 times more likely to give a donation to a non-profit than someone who doesn’t volunteer. If you’re thinking that these statistics only ring true to paying customers at a for-profit business, think again. A recent 2013 study by Journal of Extension, concludes that decision making when it comes to volunteering has, similar behaviors and motivations to those who are making the decision to make a purchases. Most of these behaviors centering around the two primary categories of brand loyalty and satisfaction. Similarly, a Fidelity survey indicates that nearly 50% of people agree that the volunteers of today have a different motivation than other generations. Most of these motivations stem from their experience volunteering, versus what they actually accomplish as a volunteer. Having a great experience as a volunteer plays a vital role. 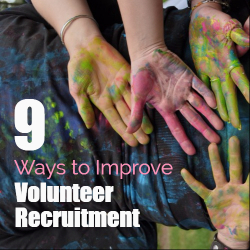 It leads to a volunteer either being retained, or moving onto the next organization. Worst case scenario, tell more than twenty people about their bad experience. It’s important to recognize that volunteers are essentially “customers” of volunteer opportunities. The volunteer opportunities are what the volunteer is seeking and ultimately shopping for. When you take the stance of the volunteer being the customer, the above statistics are revealing. Applying essential elements of customer service to apply. Here are some of the essential elements of customer service and some measures that can be put in place to address each. This is a list of 9 customer service musts that have a unique impact on what a customer thinks or feels about a brand. I will hit on each of these from the perspective of volunteer management. Well-Designed Website: A well-designed website aids in getting information about volunteer opportunities, calendar of events, how they can register or apply, or contact a lead staff member to get more detailed information. As a result, potential volunteers can easily navigate the website, find needed information and apply to be a volunteer. The fewer steps it takes to apply or register, the better. Ease of Access: The easier opportunities are to volunteer for (accessibility of location, and scheduled date), the likelier it is that a volunteer will commit. Try scheduling opportunities on dates and times that volunteers have off from work, and host the opportunity at a location that’s easy to transit to. You’re likely to have a higher turnout because it’ll be convenient and less of a burden for the volunteer. Responsiveness: Timely replies to email inquiries and returning missed calls in a timely fashion are key. It’s important to strike while the iron is hot and their enthusiasm is high. This will help with the urgency in which volunteers react to your call to action. Equipped and Trained Staff: The worst thing to fall victim to is wasting the volunteers’ time by not being properly equipped. Hurrying up only to wait is unacceptable and is one of the biggest points of negative feedback given by volunteers to nonprofits. Simply not being organized. Get ahead of this curve by training your staff and preparing in advance. Properly equipped and trained staff will be empowered to direct volunteers, and provide the necessary guidance to accomplish the tasks assigned. This will help cast a positive light on the organization and how it’s regarded by volunteers, communicating to them that your events are well planned and efficiently run. Patience Managing Your Volunteers: While this is a must, this just means that over time, and likely through trial and error, the volunteer administrator or nonprofit organization staff will have to get good at knowing when to cut losses and decide when volunteers are a bad fit. While I do believe that more can always be done to divert the energy of volunteers into productive outlets, as managers of volunteers, you can fire volunteers. Being patient will allow enough time for you to determine the return on investment from a volunteer. It will also help you better assess if certain volunteers are qualified for the job, if more training needs to be conducted, or if it’s time to part ways. But the bottom line is only time will tell, you cannot rush to judgement here. Openness to Criticism: nonprofit managers ought to look at each piece of criticism as a chance to change or fix something that is broken. Do not take these as personal attacks. Creating a survey that volunteers can respond to, and allowing for feedback in after action reports is crucial to making improvements. Through these mechanisms you’ll be able to correct deficiencies, but it starts with being open to feedback. Positive Spontaneity and Appreciation: A verbal “thank you” goes a long way, so I urge folks to not stop there, and be creative about it. “Thank you” can include letters, cards or annual awards, but can also come through social media such as tweets, Facebook posts, blog posts on the website or even an article in an organization’s publication. While volunteers won’t often ask to be thanked, kind gestures make all the difference. It can leave them feeling over joyous about their experience only reinforcing their commitment to your organization. Trustworthiness: Trust goes both ways. You’ll need to trust that the customer’s feedback is true, whether it’s about the way they perceived something, an argument with a paid staff member, or receiving poor service. In the end, the trust you put forth in volunteers will be reflected in the way these situations are handled. If there’s no trust, it will show, and reflect back in how volunteers treat their commitments to the organization. Managing Expectations: I always tell people that the hardest part of managing a network of volunteers is managing personalities and expectations. The expectation is formed from everything communicated to that volunteer, from the hours you tell that volunteer they’re committing to, to making sure the volunteers time is utilized effectively. It is important to make sure the service project doesn’t deviate from what was originally communicated. By properly managing expectation, you double down on trustworthiness, showing consistency which fosters an environment that’s comfortable and “known” to volunteers. It’s no secret that many successful for-profit companies have entire teams, processes, policies and software packages. Understanding the stigma that resides around the dreaded “overhead” or administrative costs at nonprofits, you may also claim you can’t possibly afford the same robust customer service packages and personnel needed. While that’s true in many circles, I’ve learned there are many free and low cost alternatives that can be utilized. Another thing I’ve learned over the years is that common sense isn’t always common knowledge. In an industry where volunteers are utilized so often, with approximately 62.8 million Americans volunteering in 2015 alone according to Corporation for National & Community Service data, volunteer management as a profession, and the value placed on volunteerism is still awesomely underrated. As a result, simple customer service practices are overlooked. When viewing the volunteer as the customer, I’ve began to understand that human capital is so valuable to the sustainability of a nonprofit. It offers countless benefits in the long term. If similar customer service practices found in the for-profit industry are adopted in volunteer management, the return on investment can be seen in increased public engagement and awareness, new opportunities to cultivate support, and ultimately more donations for years to come. It starts with valuing people first and seeing volunteers as customers who deserve to be a high priority. Employee engagement is one of the principle concerns among business leaders around the country who aim to create an effective and satisfied workforce. In fact, according to Gallup’s most recent U.S. employee engagement survey, employee engagement is closely correlated with business conditions essential to an organization’s financial success, such as productivity, profitability and customer engagement. In short, engaged employees are more committed to the company they work for and are invested in its success by driving the innovation, growth and revenue their employers rely on to stay ahead of the competition. For employers, investing in their most important assets – their employees – can have a transformational impact on overall business outcomes. The real question is, how can an organization create a culture of engagement and what employee benefits drive the highest levels of engagement and employee satisfaction? Unfortunately, there isn’t a “one-size-fits-all” approach. In today’s war for talent, attracting and retaining the best employees are more important than ever. As the U.S. workforce continues to shift in demographics, employers need to consider embracing a host of new benefits that appeal to a multi-generational workforce. 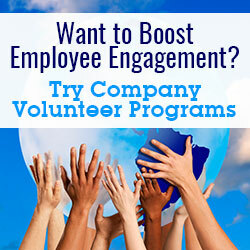 Among the many benefits options available, volunteer programs should not be overlooked. According to a Deloitte Millennial study, 75 percent of the workforce will consist of millennials (those who were born after 1982) by 2025. As more young people enter the workforce, they bring with them a new set of priorities. In fact, a study from the Intelligence Group found that 64 percent of millennials said they would take a lower-paying job that they found fulfilling over a job that they didn’t enjoy, even if they had the opportunity to earn more than twice as much in an unfulfilling job. Millennials care about diversity, company ethics and the opportunity to give back to their communities. These priorities are essentially creating an entirely new workplace model for employers, one in which a company’s moral compass is just as valuable as its bottom line. Commitment is key. Demonstrate company executives’ commitment to volunteerism and charitable giving. Share a clear vision for the program and examples of milestones and long-term goals. A recent GreenBiz study found that millennial employees prefer working for leaders they admire in companies that exemplify strong values that underscore their corporate social responsibility. Understand employee passions. Ensure the program focuses on one or more issues that truly engage employees on a personal level by soliciting their input upfront. Survey employees to determine the community issues or causes most critical to them today and in the near future. Are they passionate about addressing homelessness, bridging a local opportunity gap or improving community parks? Understanding the issues of greatest importance to employees will empower companies to deliver more engaging volunteer programs. Go social. Create opportunities for employees to connect with each other about their employee volunteer efforts. These initiatives could range from creating a company-only internal blog platform where employees can share experiences and photos with one another, to kicking off a company e-newsletter highlighting employees’ charitable efforts or even promoting the company’s volunteer efforts on the company’s Facebook or Twitter profiles. It’s important to remember that charitable efforts can also create excellent team-building and leadership opportunities for employees. Think beyond monetary commitments. Donation-matching programs and other fundraising initiatives are a great start, but it’s also important to consider alternative avenues for employees to offer their time and talents to causes important to them. According to America’s Charities’ Snapshot 2015, nearly 60 percent of companies offer paid time off for employees to volunteer. This same survey shows a growing expectation among employees that employers will provide volunteer opportunities for teams of their colleagues – 82 percent said employees want the opportunity to volunteer with peers in company-supported events. Creating a comprehensive employee volunteer program as part of an organization’s overall employee engagement strategy can help companies attract and retain top talent. They can result in stronger relationships with the surrounding local community, an enhanced public image, and a happier, healthier and more productive workforce. Every nonprofit works hard to be a good steward of donor dollars. As donor expectations continue to increase, all nonprofits are confronted with new (and often expensive) challenges—expectations of better operations, more transparent reporting, outcome measurement and better technology. As nonprofits seek funding to manage these new expectations, the challenges mount. Some funders, enthralled with the overhead myth, stipulate their gifts must be targeted toward specific program budgets leaving few resources for the fundamental building blocks of running an organization. An increasing number of nonprofits compete for the limited number of capacity building or technology grants offered. Perhaps no key function at nonprofits gets neglected more than technology. In fact, research from the Nonprofit Technology Network (NTEN), which works to improve nonprofits’ use of technology, indicates that the median IT budget at nonprofit organizations may be as low as one percent of the overall operating budget. With so little money earmarked for technology, not only is the cost of business applications far beyond the financial reach of many nonprofits, but top-flight technical talent is also difficult to attract and not always possible to develop internally. Fortunately, a growing number of technology vendors — NetSuite included — have made it a standard practice to donate technology products to nonprofits. While some product donations are ready to go out of the box, many require tech talent to oversee implementation and make these valuable gifts work for the organization receiving the donation. An unintended consequence of free technology is it often doesn’t solve the resource constraint problem – nonprofits still need the resources to purchase consulting and other services. 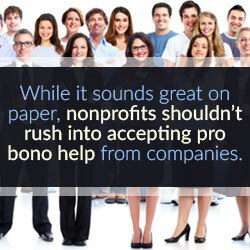 One answer that benefits nonprofit and company alike is pro bono volunteering. And while enabling employees to volunteer as project consultants on the technology rollouts at nonprofits sounds like a good idea on so many levels, it’s surprising to learn that it simply doesn’t happen very often. In fact, pro bono volunteering is an untapped resource on all fronts, not just when it comes to technology. According to the Taproot Foundation, which works to help match nonprofits with pro bono skills, just three percent of nonprofits say they have access to the pro bono support they need. NetSuite realized that, for our technology donations to have a transformational impact on nonprofit operations, we had to pair them with pro bono services. Along the way, we’ve learned that a pro bono volunteer program not only helps our nonprofit customers thrive, it also strengthens our business by giving us more insight into the needs of an important customer constituency, deepens and develops the way nonprofits use our software, and provides our employees with invaluable on-the-job training and an opportunity to give back by offering their professional skills. Along those lines, according to research from True Impact, a consultancy that helps organizations measure the social, financial and environmental return on investment (ROI) of their programs and operations, employees are three times as likely to gain material job skills via pro bono volunteering as they are with traditional volunteering. In other words, giving away employees’ time in the form of pro bono volunteering effectively injects them with additional value to the company. Find the right partner: Free help from professionals sounds great – but you should strategically decide when taking on pro bono help makes sense, and from whom you will get it. Someone offering to do a social media plan pro bono might not be a good fit if your organization doesn’t have a communications department or a process to put the plan to action. The best bet is to identify what you need help with and determine which companies are experts in that field. Some of your existing corporate partners might be the perfect pro bono partners, provided that they have expertise in the area you want to improve. Have a clear scope of work: What are your goals for this project? What is the outcome you want to achieve? Identifying what the specific deliverables will be as well as what is in-scope and out-of-scope is a critical piece of working with pro bono volunteers. Will the volunteers be providing training, product support, consulting or something else? Outlining the expected deliverables and timelines up front will help you feel better about the time and effort your organization and volunteers are investing in a project. Treat this like a professional engagement: Would you pay a consultant to take on a project and not devote staff time and resources to manage that project? Of course not. The same should be the case for pro bono: budget the time and internal talent you’ll need for a project, meet with your volunteers, and stay on track to receive the deliverables at the end of the engagement. Connect it to the Mission: Connecting project need with social impact will help to get volunteers engaged and excited about the work they will be taking on. Sure, writing a script to make a report auto-generate might not feel core to your mission, but automating that process might free up your staff and volunteer resources for other mission-critical work. Making that correlation for the volunteers will help them see the impact of the project they are taking on. Every company approaches pro bono differently, and many have not yet started a program, although thanks to campaigns like ‘A Billion+Change’ the move to provide pro bono support is gaining momentum. At NetSuite, we formally launched our NetSuite.org SuiteVolunteer Pro Bono program in 2013 with a commitment to take on a significant number of pro bono projects each quarter. We have been seeing the fruits of our labors ever since, with employees gaining invaluable on-the-job training and many of our nonprofit software users emerging as stronger users of the platform. Our employees desire to donate pro bono time is evident in the program’s growth: since it launched, more than 700 NetSuite employees have given nearly $1.5 million worth of their time to more than 260 nonprofits. In 2015 alone, more than 300 SuiteVolunteers donated 4,694 pro bono consulting hours, worth more than $700,000 using the industry standard valuation. One of the keys to the SuiteVolunteer program’s success has been a focus on small, digestible projects that begin and end within a quarter. We assemble our pro bono project teams during the first month of each quarter, and each team completes its project over the ensuing two months. Generally speaking, each quarter now features about 100 employees working on 30 to 40 projects. This distributed approach has enabled us to get more employees involved on more projects, thus impacting more nonprofits. These projects also act as building blocks for our nonprofit partners. We aren’t trying to take on all of their challenges at once, but instead are looking for small, incremental ways to improve their operational success. The bottom line of all these efforts is the power that comes from sharing talent. Every company has incredibly talented employees in its ranks, many of whom want to use their skills to make a positive social impact. Nonprofits and corporations that are able to harness the skills of these passionate employees will find that the benefits of pro bono contributions run deep. What’s more, taking a strategic approach to choosing a pro bono partner and thoroughly outlining the need you’re addressing can ensure a successful project. For corporations, providing pro bono opportunities for your employees will not only engage your employees and strengthen your business, but can inspire your customers and partners to develop similar programs, thus exponentially driving change in the social sector. Pro bono help, once thought of as only something lawyers provide, is growing more prevalent across business sectors. 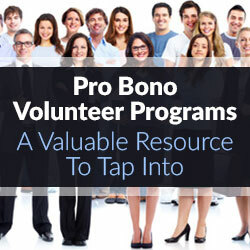 By effectively tapping pro bono volunteer skills and corporate pro bono programs, you will gain access to a new pool of resources that can help build capacity and fund those often overlooked “overhead” projects. For businesses, their employees and the nonprofits they serve, pro bono volunteering can be the ultimate win-win-win. Whether they are raising awareness, picking up trash or engaging with those in need, volunteers are one of the largest and most valuable assets to nonprofit organizations. With limited manpower and tight budgets, we’re grateful for the time volunteers donate and usually assume that is all they want to offer. In reality, they have much more potential. A loyal, committed and engaged volunteer group takes their work as seriously as paid employees and will benefit both your nonprofit’s cause, and the lives of those involved. 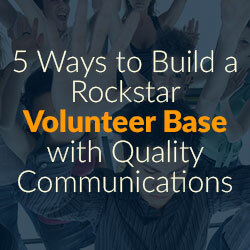 One key to building a rockstar volunteer base is communicating the right way. How you communicate with volunteers defines your organization’s volunteering culture and determines how your volunteers feel about the work they accomplish. Trying to communicate with everyone at your organization all at once creates a generic, boring message that doesn’t resonate effectively. Since our minds are designed to communicate with people one-on-one, a great way to fix the barrier is by creating a volunteer character profile. Take some time to identify the characteristics that best fit the majority of your volunteers or the volunteers you want to connect with the most. How old are they? What are their interests? Are they in school? Are they retired? What do they do on the weekends? Why do they like your organization and want to volunteer? Example: Mike (John Doe) is a young professional that just got out college and wants to spend his years doing good for his community and having fun before settling into a nine to five job and starting a family. He is tall, brown hair and really likes working with children and the outdoors. From there, print your character profile’s face and name with his description on paper. Talk to this character every time you craft an email, social media post or flyer. Your message will resonate with the lives of your volunteer base and grab their attention. Extra Tip: Don’t assume a lawyer that is volunteering will want to do legal work for your organization. Don’t pigeon hole your volunteers in their career skills because chances are they’ll volunteer more if you give them a vacation from their day job, not an extra shift. The reason your volunteers take action and the reason they support your cause are often very different. In many cases, you can assume your volunteer base already supports your organization philosophically. To maximize results, focus on what motivates your John Doe volunteers to spend their free time coming to your event and supporting your organization. Other volunteers may be looking to develop skills, build their resume or try new things. If they already support your cause, speak to these needs first and watch your attendance rise. The best volunteers not only feel connected to your cause, but also to staff members and fellow volunteers. Your volunteers need to see everyone as a friend rather than an acquaintance. Ensuring your volunteers feel comfortable is key to getting them excited, returning more often, sharing ideas and going above and beyond. To build a sense of camaraderie, you can create t-shirts, get-togethers and happy hours after volunteer events. For your most loyal volunteers, invite them to staff brainstorms and bonding activities. Incorporating the personality of organization and staff members into your communications will help them feel like they are part of the tribe. Extra Tip: Team up with other like-minded nonprofit groups to host volunteer gatherings and events and create a larger, united team. 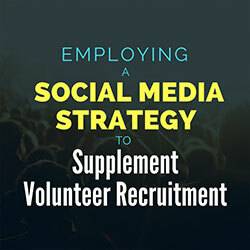 You’ll offer your volunteers more opportunities to get involved and extend the reach of your communications. People learn through repetition. Once you have perfected your message to resonate with the right people, standardize it across all of your media channels and re-use your content. With repetition, your brand’s message will become its identity. It will also save you valuable time and money and ensure your message is of the same caliber, whether it’s your executive director or your social media intern broadcasting it. For example, my client, San Diego Coastkeeper, regularly produces flyers, event information, environmental tips and press releases. All have the organization’s logo and mission statement, “protecting and restoring fishable, swimmable and drinkable waters in San Diego County,” on all content. All communications professionals will tell you, follow up is key! Whether this is the first time the volunteer showed to get their hands dirty, or a volunteer you have a relationship with because they continue to return—follow up and make them feel important. Following up can be as simple as a personal email or thank you card. Thank them for their time and let them know how they impacted your organization and the community. Honors and awards also keep volunteers motivated. Award a new volunteer as “Volunteer of the Month.” Display this award in a high-traffic area and share across social media channels to motivate other volunteers and reinforce their value. Steve is the nonprofit sector’s new consultant. Highly skilled, mission motivated, organizationally aware, and best yet, pro-bono. Steve, in this case, is a member of the March of Dimes National Volunteer Leadership Council. The Council is made up of expert volunteer leaders, a diverse group of men and women, who have made their way through the March of Dimes ranks. These leaders have done their time as committee members; event chairs; committee chairs and even as Chairs of local market boards. They are the organization’s brain trust. They have institutional memory all the while having a vision for our future. They are the lead consulting agency for the organization, albeit without the hefty price tag. These individuals are empowered to drive our business using a peer to peer, volunteer to volunteer approach. They are trained at the National level, but have the practical experience of local leaders. In the March of Dimes model, the Council has a primary focus of providing consultation services on the subjects of recruitment, retention and engagement of volunteer leaders. Council members are experts on the topic of building boards. Every market needs to have an effective board and many are challenged at building one. These volunteer Council members are an invaluable resource to their volunteer peers around the country. Most recently, these volunteer consultants took an “invest in your best” approach, traveling to support local volunteers in key markets including Chicago, Fort Lauderdale, Atlanta, Los Angeles and Houston to help strengthen their board development approach. They met with the local market board chair and local staff to plot out a strategy to take these high potential boards to the next level. It’s not a one-off engagement, rather it becomes a partnership. Think of it as a retainer-based model, paid for in good will. The construct allows the local market chair and local staff member to have ongoing access to the volunteer consultant. The consultant learns the market, learns the opportunities and challenges and becomes a fixture in the lives of the local team, lending their knowledge of his or her own market and others around the country. Small fees may apply associated with travel. But even for those nonprofits on a shoestring budget, the consultation engagement can take place by phone or video chat. In following standard volunteer development tenets, it is a proverbial win / win for the organization. These volunteer consultants are satisfying their own volunteer motivations while serving and benefitting others. Every organization has these leaders. And every organization can deploy them. Why does the model work? These volunteer consultants have seen and experienced the “best practice” model. They were selected for service on this Council because of their success in their own market. They are able to “talk the talk” having previously “walked the walk” when they served in that lead local role. They understand the organization – its strengths, its weaknesses and its political realities. This form of volunteer consultant knows what is feasible and what is fantasy. In his 25 year association with the March of Dimes, Council member Frank Wall of Oregon has traveled the country for years as a March of Dimes volunteer consultant. When Frank cautions a group of board leaders on the pitfalls of one strategy over another, they tend to listen. The model brings corporate pragmatism to the nonprofit board room door. These outside volunteers are corporate leaders during their day job. In this model, they truly are regarded as consultant experts, bringing new vision and enthusiasm to an existing board. My former colleague liked to quote the adage, “You can’t be a prophet in your own land.” But you can be a prophet at someone else’s board meeting. These volunteer consultants are expanding their own reach. It provides them with an opportunity to impact a market well out of their own geographic range. They can prove out their own model by testing it in other areas across the country. The added bonus is the opportunity for this volunteer consultant to network with leaders in another geography. We have already seen the fruits of this effort, with the aforementioned local boards noting an increase in board engagement, new recruits, and an expanded understanding of the best ways to leverage relationships for purposes of mission implementation and revenue production. Next, their focus will turn to the key initiatives associated with Prematurity Awareness Month this November. Our Pledge Purple for Preemies online campaign will ask individuals to commit to take action during November to help us raise awareness and fight premature birth, the #1 killer of babies. Fundraisers, prematurity summits and purple lightings across the country will help spread the word and the March of Dimes efforts to find the unknown causes of premature birth and prevent babies born too soon. Visit www.marchofdimes.org. The consulting world has employed this model for years. It’s time to apply it to the nonprofit sector with a slight twist. Identify your best leaders, connect them to one another, stay out of their way, and let them work their magic. This is the opening statement used in the training program for new volunteers applying to become hotline staff for the Samaritans Suicide Prevention Center in New York City, a role that, should they satisfactorily complete the program, will result in their taking some of the 85,000 calls Samaritans responds to each year from people in crisis. Besides setting the tone that will be utilized in the 32-hour intensive training to follow, the statement presents the potential volunteers with Samaritans’ philosophy and approach and, most importantly, the behaviors the organization requires from those who will, ultimately, be on the front lines providing our emotional support and crisis response services to people who are depressed, experiencing trauma, self-harming and suicidal behavior. 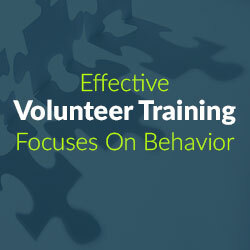 This focus on behavior is at the heart of Samaritans training—in both our hotline volunteer programs as well as the professional development training we have done for over 40,000 lay and professional health providers in New York City and environs over the past 25 years. It is based on our own experience—as part of an international suicide prevention network with over 400 centers operating in 42 countries that have responded to tens of millions of people in crisis over the past 60 years in the US, Europe, Asia and Africa—as well as communications theory, research studies on rapport-building, stigma, at-risk individual’s resistance to seeking care and, dare I say (though in this evidence-based world this is an unpopular comment), common sense. Basically, we have learned that if people who are in distress are not comfortable with you, if they do not trust you, if you cannot communicate clearly with them; it does not matter how smart or caring or well-intentioned you are. You are not going to be in a position to help. Added to this is the fact that working on a confidential 24-hour hotline is akin to an extremely challenging professional job, just in this case the work is performed by people who do not get paid (think nurses who volunteer at hospice centers, volunteer fire and rescue team members, emergency service and disaster responders). So the need for the individuals who are to staff the 24-hour hotline to be punctual, attentive, focused, accountable and able to follow directions, whether they understand them or not, is paramount. Therefore Samaritans training does not wait to see how volunteers will perform once they have the position, we simulate and replicate that environment in training class. The need for a behavioral-focused approach to training is by no means unique to Samaritans though we are, admittedly, very demanding of our volunteer staff due to the nature of our work. But the fact is that many executive directors and volunteer coordinators of charities and nonprofits will admit in quieter moments, off the record, that though the enthusiasm and motivation of volunteers is extraordinary (frequently better than their paid counterparts), it is a tremendous challenge to separate the individuals who are sincere and devoted and are able to help within the confines of the organization from those who (whether they realize it or not) are more focused on helping themselves. Most volunteer applicants when being interviewed will say that they are responsible, punctual, team players, open-minded, etc., but determining which candidates can actually behave that way is a necessity throughout both the recruitment and job training process. I have met countless executive directors and volunteer program managers over the years that have expressed their envy of Samaritans’ ability to provide 24-hour hotline coverage 365 days a week, all with un-paid volunteer staff. “How do you do it?” they ask. The answer? “We remove people who come late to training class.” It’s that simple. Our belief, and 30 years of training over 3,000 hotline volunteers confirm this: If you cannot get to training on time for a job you say you want; if you cannot be responsible and follow directions; then it would be a mistake to “hire you” to do the job when it counts. And that is not to be cynical or negative, for volunteers are the lifeblood of Samaritans and have been since its inception in the early 1950’s, a period of time that we have collectively answered tens of millions of calls from people in crisis. In fact, I began as a hotline volunteer over 30 years ago, which led me to change careers and become associated with some of the finest people I have ever known. But not every person who wants to work in a certain environment is a good match for that organization and its needs. This is true in the volunteer sector, as it is in the academic and corporate world. Otherwise, I would be a world-renown jazz guitarist and no one would be reading this piece. People have different strengths and weaknesses, different capabilities and it is up to the training program and the staff who implement it to do the best they can to match motivated candidates with the organization’s mission, focus, image and services. So, again, at Samaritans, we find that it always comes back to behavior; and that is a thread that runs through our volunteer recruitment, training and, ultimately, individual performance evaluations. We find that people who are able to satisfactorily practice certain behaviors tend to be successful in our environment and those who can’t, no matter how nice, well-intentioned, educated or sincere, do not. You are either part of the problem or part of the solution, said a famous social activist. The ability to communicate effectively, a behavior that plays a significant role in the functioning of every nonprofit volunteer organization, as well as the services they deliver, is a prime example. Over the past 25 years, I can tell you that, almost without exception, every person who has applied to be a hotline volunteer has started out considering themselves to be open-minded, non-judgmental and a good listener. I can also tell you that, after the first day of training, almost every one of them was in utter shock to learn how self-directed their communications were, how many assumptions they made and how much they tended to talk instead of listen. The same is true with the behaviors of being collaborative, a team player, having a good attitude. We have learned over the years to utilize exercises, roleplays and interactive discussions into the program (some of them using natural work teams; others, actor-trainers; still others, tools used in survival training, corporate communications, Zen practice) to see how people respond to simulated job environments. These are easy behaviors to confirm in good candidates and even easier to identify in those who do not exhibit them or present the opposite—the monopolizers, the proselytizers, people who get sullen when they don’t understand something, the constant hand-raisers who interfere in a program’s progress, etc. Every organization knows from experience what behaviors and attitudes work in their environment and which undermine and compromise. Identifying them, creating environments where they can be played out and tested, where people can be viewed interacting individually, on a small team level, as part of a larger group; these exercises reinforce the behaviors and attitude an organization wants people to practice as well as uncovering those individuals who struggle with them (and may need additional help) as well as those who just don’t fit in. Parallel to the behavioral aspect that is a thread throughout the training program, there is a step-by-step process that takes the candidates through the information and skills they will need to utilize to do the job. On that front, as we begin, we make sure to tell every participant that they are all starting at the same level and it does not matter what their individual background, education or experience is. Then we start with the basics. For the communications module, we define listening. We draw diagrams showing that our focus is always on the receiver of the message, not the sender. We outline what a declarative sentence looks like (because, whether you like it or not, the average American college graduate has an 8th grade reading level). We use practice pairs (like exercise partners), we do drills (like music teachers having students practice scales), we utilize team exercises where they do group problem-solving (reminding them that everybody plays). We work cooperatively and collaboratively and have assistant trainers observe who works well together and who does not. After every exercise we debrief as a group, providing an outlet for their feedback and for them to express the challenges they are dealing with (and we observe these behaviors as well). We explore together how things went, what was effective and what was not and what we need to work on. We joke about how it felt going to the gym for the first time believing we needed to get in better shape, only to learn after the first workouts what really bad shape we were in. We balance being serious with being light-hearted, constantly reminding people this is a process and not to look over their own shoulder, that we are nowhere close to evaluating anyone. We are just working together, doing our best to practice the behaviors we know are the key to doing hotline work effectively and remind them that everyone has gone through this process and they need to go through it, too, but we are going to help them every step of the way.